It’s been a tense week for Uber, the dominant car-hailing service, which came under fire on Tuesday after the company’s SVP of business suggested his company spend millions of dollars to hire people to investigate the private lives of its vocal critics in the media. And though the tech scene is up in arms about the off-the-record comments, many of the people we spoke to say they haven’t deleted the app or their Uber accounts. So while people might be upset at Uber’s PR right now, there’s no data to suggest Uber is in trouble: the company is leagues ahead of its competitors — both in number of weekly rides facilitated by the service, and the number of payment cards on file. 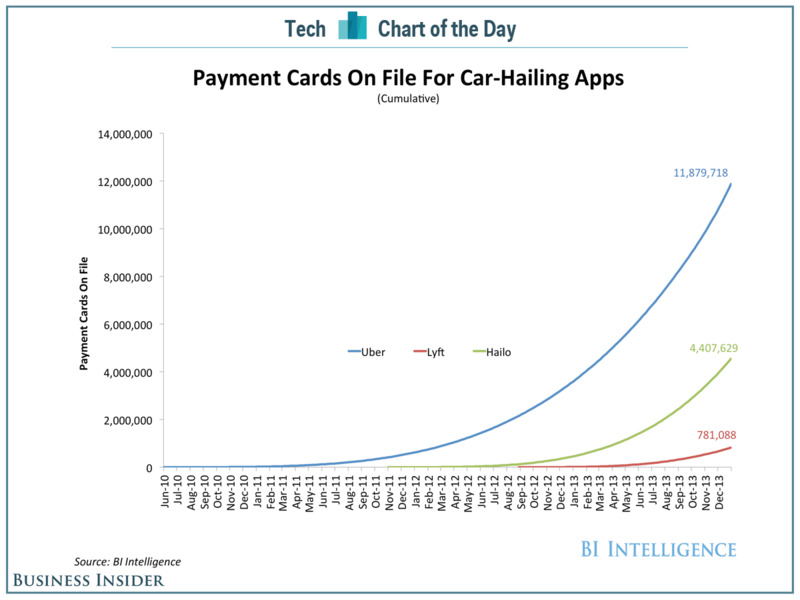 Based on leaked company data charted for us by BI Intelligence, Uber had north of 11.8 billion payment cards on file as of last December, and considering the company’s upward trajectory, the company is likely far beyond the 12-million cards mark. 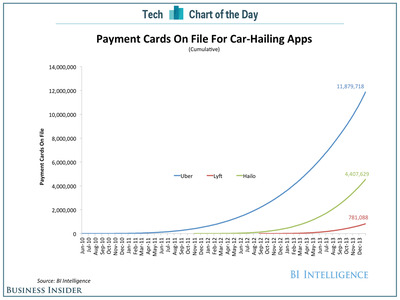 Comparatively, Hailo and Lyft, two Uber rivals, had only 4.4 million and 781,000 payment cards on file.